This skin whitening brand from Davao is continuously strengthening its foothold in the market. Now, it is offering franchising opportunities for entrepreneurs anywhere in the country. <>According to the beauty experts, there are two cosmetic issues that hound most Filipinos, especially those who are conscious about their physical appearance. First, they are not confident about their natural skin color (brown to dark brown). Second, they are conscious about their flat (and big) noses. This is why cosmetic procedures and products that help modify natural skin color and nose shape are popular in the market. Skin whitening products are not fads for local consumers. Those are necessary and basic products in the skincare section of groceries and supermarkets. When it comes to skin whitening products, local consumers are usually aggressive and adventurous in trying out various offerings from different brands. Interestingly, there are several local brands that stand out and eclipse the others, including the multinational and bigger ones. From Davao comes one of the most promising skin whitening brands in the market today---BN Whitening Shoppe. Stories about the effectiveness of BN Whitening Shoppe have gone viral. In fact, the brand’s products have become popular not just to consumers in Davao and some provinces in the country but also to OFWs abroad. BN Whitening Shoppe CEO Bianca Naranjo is even surprised that the company’s skin whitening products are reaching other continents like North America, Europe, and Africa. “We have recently opened a franchised shop in Taguig City, our first ever in Metro Manila,” said Naranjo. (It is located at Q-5 atrium ground floor of Sunshine Plaza Mall in FTI Complex). She disclosed, “That store is owned by one of our loyal customers, who is based in Spain.” Apparently, the customer got so confident about the potential of the products after regularly using those herself. 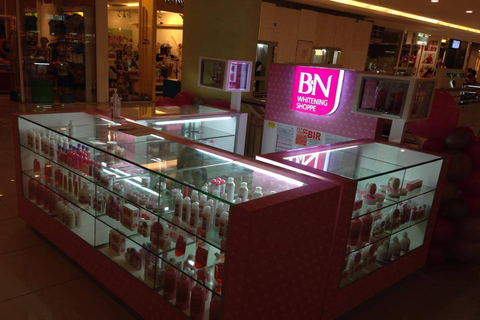 For quite some time, BN Whitening Shoppe products have been reaching some customers in Metro Manila and Luzon through special shipping arrangements from Davao. Some distributors have also been selling the skin whitening items through direct selling. But now, BN Skin Whitening Shoppe is up for franchising. “The company now offers franchise for stores that sell our products, ” Naranjo announced. This way, more consumers can get the chance to try for their selves why this brand is steadily building up its solid and credible reputation in the skin whitening industry. Naranjo also revealed that the company is now actively marketing its products so those could further go places. By this, it is quite obvious that she is confident about the effectiveness of her company’s products, even when compared to the more popular and major brands, which have been around in the market for quite some time already. She even shared some feedback she got from several of her customers. According to her, some of the most satisfied users of BN Whitening Shoppe products attest to how effective those are in making the skin color lighter in a short span of time. Some users claim that skin whitening gets obvious in as fast as five days upon regular use of the brand’s whitening soap and lotion. What’s more? BN Whitening Shoppe products are made of mostly natural and safe ingredients. That is why the items are hypoallergenic and are generally safe for daily and frequent use. You can be a distributor and business partner of BN Whitening Shoppe. Also consider getting a franchised store that exclusively sells its products. Check out its online directory listing here.